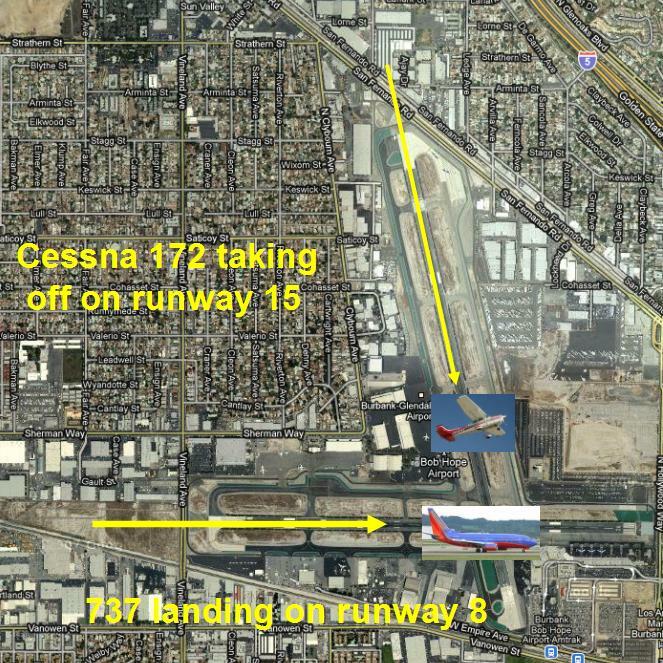 The NTSB reports that on Monday April 19th, a Southwest Airlines 737-700 (N473WN) with 124 people on board nearly collided with a Cessna 172 at Burbank Airport in California. At the time of the incident, the aircraft were using intersecting runways at the airport. 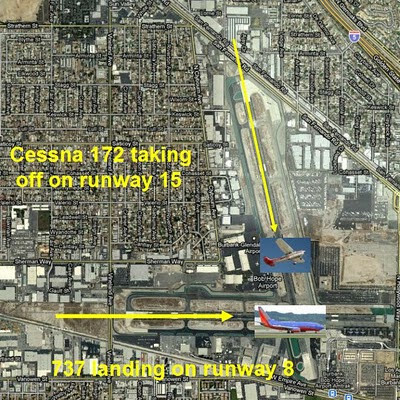 The 737, with 119 passengers and a crew of five, was landing, while the Cessna was taking off on an intersecting runway. They nearly hit each other at the intersection of the two runways. No one on either aircraft was injured and neither aircraft was damaged. At about 10:58 a.m. PDT on April 19, Southwest Airlines flight 649 was inbound from Oakland to the Burbank airport (also known as Bob Hope Airport) and was landing to the east on runway 8 while the Cessna 172 had just taken off to the south from runway 15, passing over the 737 at the intersection of the two runways. The Cessna had been executing a “touch and go” landing on runway 15. In a touch and go landing, an aircraft lands on a runway and immediately initiates a takeoff without first coming to a complete stop. According to the FAA, the two aircraft came within 200 feet vertically and 10 feet laterally of each other at the runway intersection. The NTSB report doesn't state whether the touch and go landing was a planned maneuver on the part of the Cessna pilot, or if the maneuver was done in order to avoid hitting the 737. At the time of the event, skies were clear with 10 miles of visibility. The NTSB is currently investigating this event, and AirSafeNews.com will publish the findings of this investigation, including any safety recommendations. AirSafe.com lists at least 16 fatal midair collision events since 1960 where at least one airline passenger was killed. Of those 16, four involved single engine private aircraft, and two of those four were also in southern California. In September 1978, a Pacific Southwest 727-200 collided with a Cessna 172 over San Diego, killing all 135 on the 727, the two occupants of the Cessna, and seven others on the ground. In August 1986, an Aeromexico DC9 collided with a Piper Archer aircraft over Cerritos, which is just south of Los Angeles. All six crew members and 58 passengers on the jet were killed. The three occupants of the Piper and 15 people on the ground were also killed.